We're now just a few days out from Wrestlemania, the biggest show WWE puts on each year. But Wrestlemania means much more than a one-night PPV, even as the event itself grows in size each year. The days leading up to the show also bring a variety of professional wrestling happenings to the city in question, and much of that will start to get underway today, April 4. This year, WWE's Wrestlemania 35 takes place on Sunday, April 7 and caps off a week of the highest-profile wrestling you'll find anywhere. From WWE's own shows--which include Wrestlemania, the annual Hall of Fame ceremony, and NXT TakeOver--to the likes of Ring of Honor, New Japan Pro Wrestling, and Impact running major shows, there's simply too much wrestling for you to keep track of alone--and most of it is streaming online for those that can't travel to the New York area. 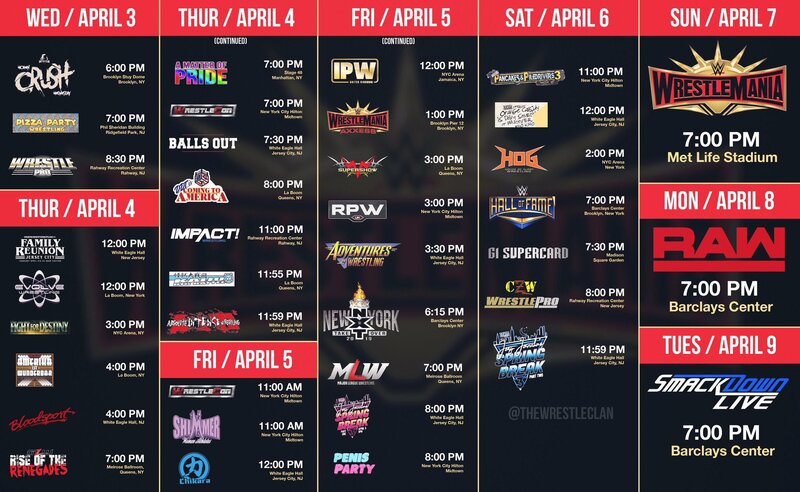 Luckily, you don't have to search high and low to figure out where to watch the most anticipated wrestling shows of Wrestlmania weekend, because we have that covered. After looking through the entire schedule of events, including dozens of non-WWE shows, we have tracked down all you need to know about how to watch them all from the comfort of your own home. So while you may not be able to travel to the New York area to partake in the Super Bowl of professional wrestling, there's no reason to miss out on events presented by Evolve, Shimmer, WrestleCon, and WWN. There's even some wackier options like Kaiju Big Battel, which is essentially Godzilla meets pro wrestling. And if you're excited for NXT and Wrestlemania, you are certainly going to want to stream the Ring of Honor/New Japan Pro Wrestling combined show streaming live from a sold out Madison Square Garden. Follow along as we dive deep into a week of wrestling insanity and find out where you can stream practically every show happening over Wrestlemania weekend.